Somalia is in the grip of an intense drought, induced by up to four consecutive seasons of poor rainfall. In the worst affected areas, poor rainfall and lack of water has wiped out crops and killed livestock, while communities are being forced to sell their assets, and borrow food and money to survive. The latest food security and nutrition analysis from the FAO-managed Food Security and Nutrition Analysis Unit (FSNAU) and the Famine Early Warning Systems Network (FEWSNET) issued on 2 February 2017, reveals that the number of people in need of humanitarian assistance has increased from 5 million in September 2016 to 6.2 million between February 2017 and June 2017. 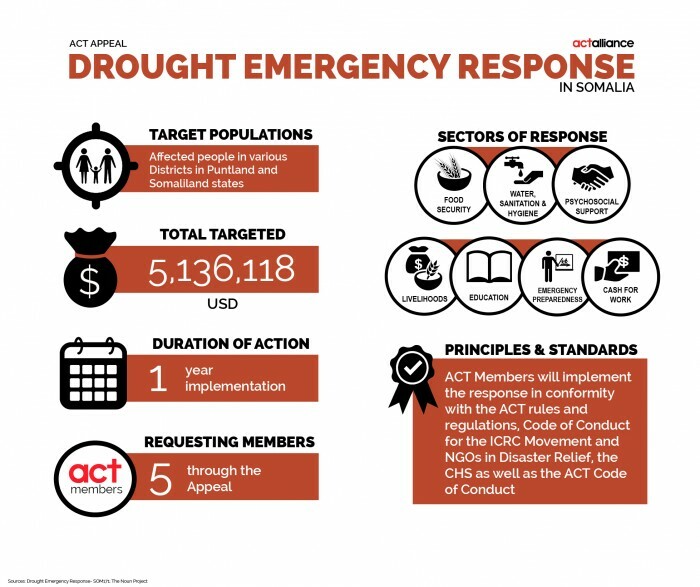 The drought situation is compounded by protracted conflict which is causing displacements, seasonal climatic shocks as a result of most extreme El Niño phenomenon in 50 years, and disease outbreaks. Preliminary forecasts indicate that below average to near average rainfall is expected to prevail across most parts of Somalia during the forthcoming 2017 Gu season (April-June). As a result, only minimal improvements are expected during this time and in some areas further deterioration in food security is possible. This sets the stage for a possible famine in 2017, if the humanitarian assistance does not reach the beneficiaries in time. ACT Somalia Forum members through NCA, FCA, LWF, Diakonia Sweden and DKH plan to respond by providing Food Assistance, Water, Sanitation and Hygiene facilities and services, Education(school-feeding programs), Health and Nutrition, Cash based interventions, Livestock interventions, as well as Early recovery and Livelihoods support to the affected populations in various Districts in Puntland and Somaliland states.